If you don't have light brown sugar on hand, sprinkle the berries with an equal amount of granulated white sugar. Serve the berries and syrup as is or with a scoop of vanilla ice cream or a dollop of lightly sweetened mascarpone cheese. Bring the vinegar, granulated sugar, and lemon juice to a simmer in a small heavy-bottomed saucepan over medium heat. Simmer until the syrup is reduced by half (to approximately 3 tablespoons) about 3 minutes. Transfer the vinegar syrup to a small bowl to cool completely. With a spoon, lightly toss the berries and brown sugar in a large bowl. Let stand until the sugar dissolves and the berries exude some juice, 10 to 15 minutes. Pour the vinegar syrup over the berries, add the finely chopped fresh mint (optional), and ground pepper to taste, and toss to combine. 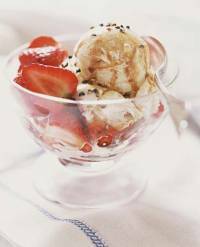 Divide the strawberries among individual bowls or goblets and serve immediately. Sprinkle with chopped nuts or ground peppercorns and serve with vanilla ice cream, mascarpone cream, or whipped cream.